Our first and second graders are crazy about Mercy Watson, the adorable, butter-loving pig from Kate DiCamillo's series of early chapter books. And they're going to love, love, love Leroy Ninker Saddles Up, the first in DiCamillo's companion series Tales from Deckawoo Drive. Sequels and spinoffs are no sure thing; but DiCamillo had me smiling and laughing all the way through this new adventure. 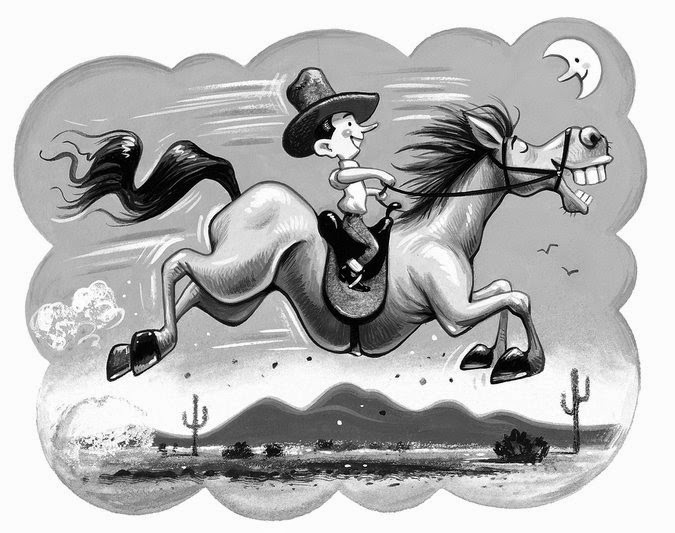 Leroy may be a small man, but he has big dreams of being a cowboy--a real cowboy like he sees in the movies. But--as his coworker at the drive-in movie theater tells him--every cowboy needs a horse. He's got to "take fate in (his) hands and wrestle it to the ground." And with this inspiration, Leroy sets out to find himself a horse and a loyal friend. When Leroy finds Maybelline, we wonder if she's the right horse for him. We can certainly see in Van Dusen's drawings that she doesn't look like an ideal horse. And yet, Leroy understands exactly what she wants: plenty of compliments, lots of food and loyal companionship. That isn't too much for anyone to ask, is it? 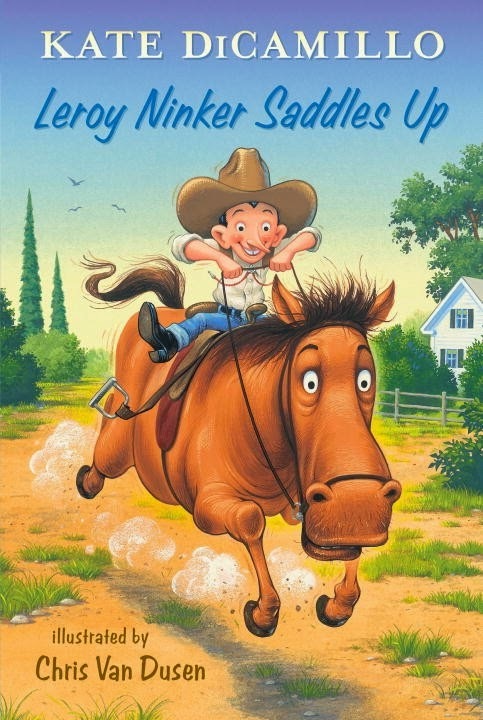 Leroy Ninker Saddles Up is a longer chapter book than the Mercy Watson series. 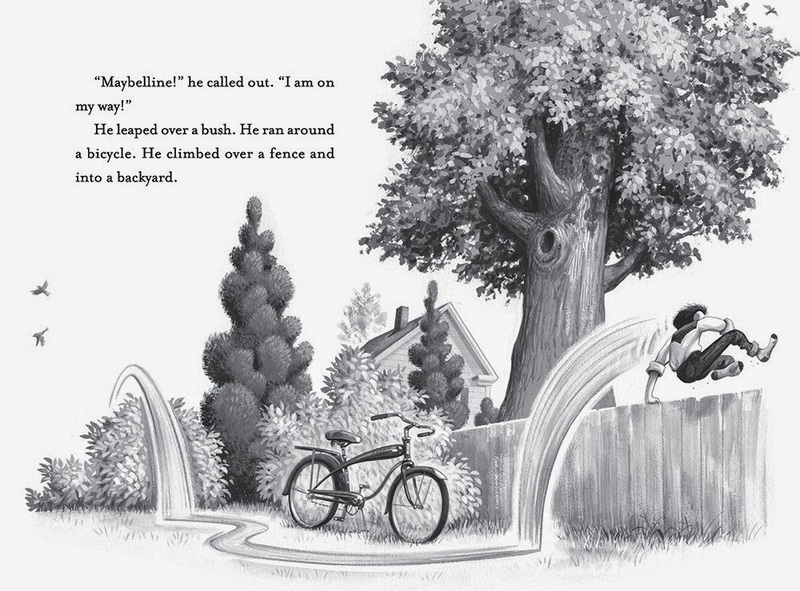 It will make a great read-aloud to first graders who are reading Mercy Watson on their own. Second and third graders who loved Mercy last year will get a hoot reading Leroy Ninker now. There's definitely more text, fewer illustrations and more challenging words. The review copy was kindly sent by the publishers, Candlewick Books, but I've already purchased three more copies to share with teachers and families. If you make a purchase using the Amazon links on this site, a small portion goes to Great Kid Books. Thank you for your support. I woke up to the sound of soft rain this morning and savored the small moment. 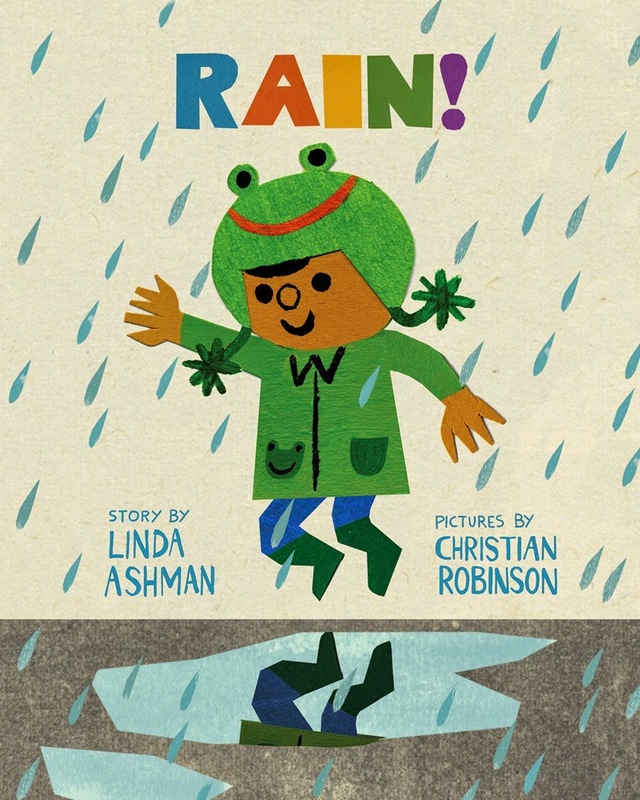 It made me think of a lovely book that all our Berkeley school libraries have: Rain, by Linda Ashman, illustrated by Christian Robinson. 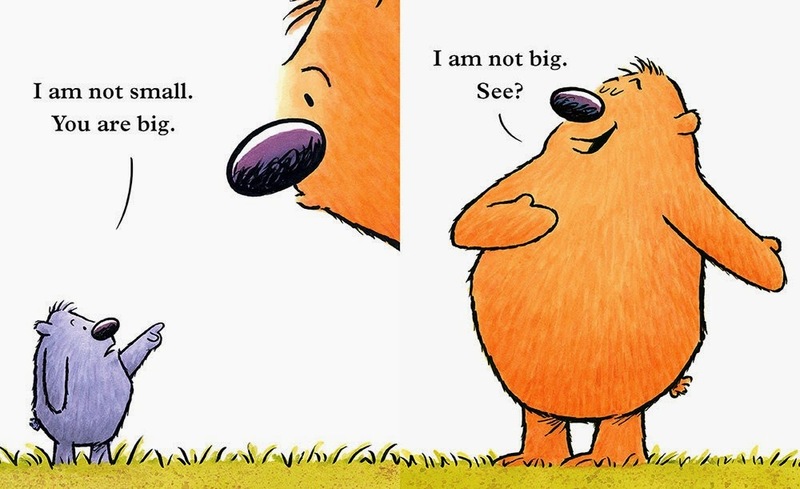 I absolutely adore this book, especially for the way both author and illustrator notice small moments. They each go their own way until they meet in a cafe. Kids will love noticing what happens when the little boy offers his cookie to the old man. Will the grumpy old man refuse, or will the young boy’s enthusiasm win the day? I loved talking with students about how the author noticed small moment details in the dialog and how the artist noticed small moment details in his illustrations. Students are talking about "small moments" as they craft their own stories, as a way to flesh out details in creative writing. Our 2nd graders noticed so many details, from the emotions of other customers in the cafe, to the interactions between the boy and the shop keeper. 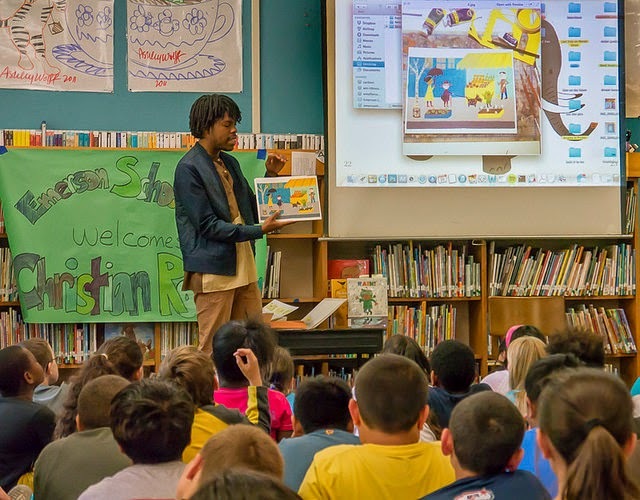 The illustrator Christian Robinson visited all Berkeley elementary schools last year, thanks to a grant from the Berkeley Public Schools Fund, and so many students will be able to remember the story and meeting the artist. He is absolutely delightful. For a bit of fun, check out his website: theartoffun.com and notice how small moments can be captured in words as well as pictures. This image (from Robinson’s Fall 2014 Publisher’s Weekly cover) is not from the book, but it is a small moment that has me smiling this morning. The review copy comes from our school library. If you make a purchase using the Amazon links on this site, a small portion goes to Great Kid Books. Thank you for your support. 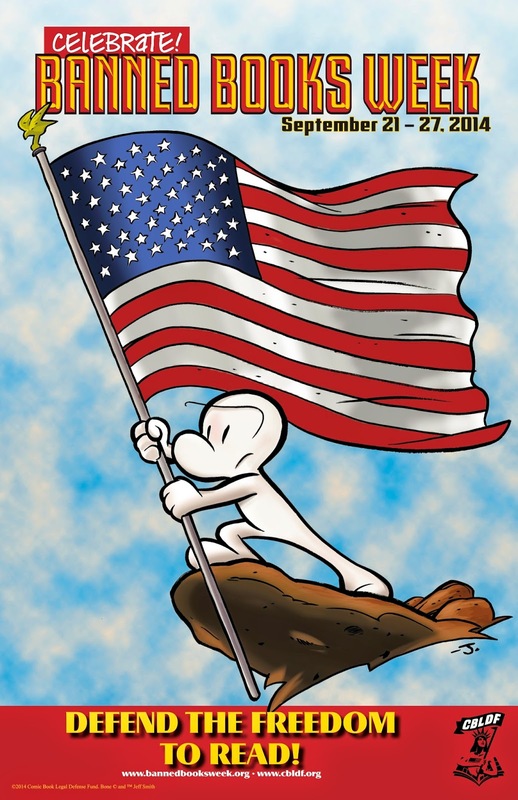 Freedom is an essential element of democracy, and the freedom to read is a cornerstone of American democracy. And yet how do we help our children understand the importance of this fundamental right? Abstract declarations are pretty hard for kids to grasp, but they will get immediately involved if they start considering a concrete example that relates to them. 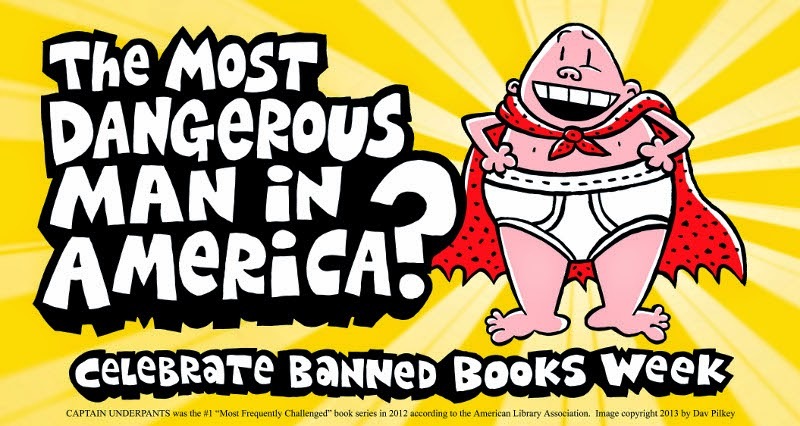 When I explained today that many schools ban Captain Underpants because it uses offensive language, our 5th graders were outraged! 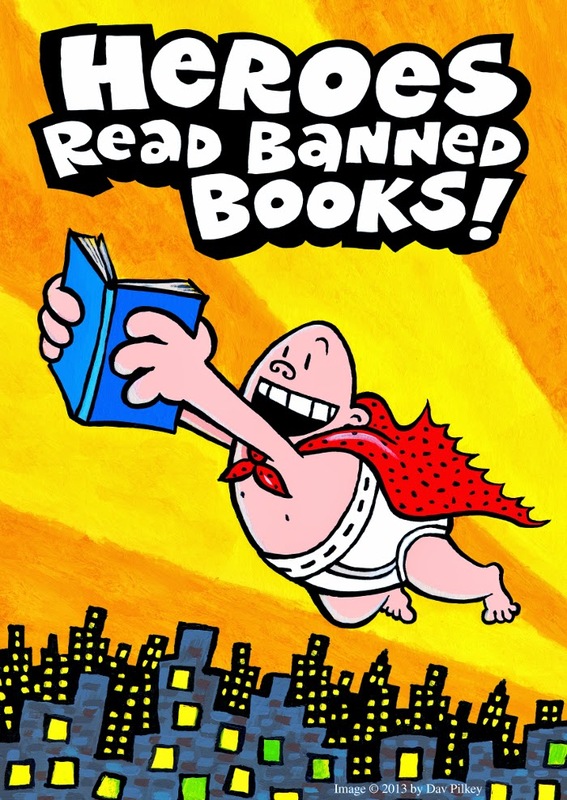 They told me that was just awful, and that kids should definitely be able to read Captain Underpants. They were incredulous that Harry Potter had been banned in schools and libraries. Pretty quickly, they could see why it is so important to stand up for our freedom to read what we want. 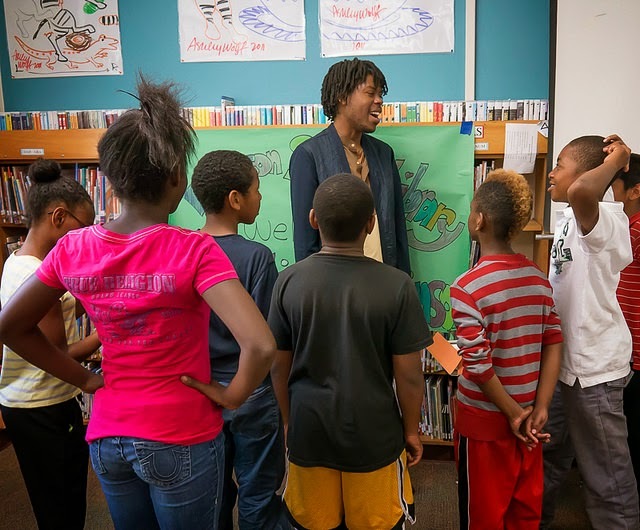 Our overall right is important to me, but I care most about how books impact individual kids. We need a wide range of books in our libraries because we need to connect so many different kids with books that make a difference to each and every one of them. "It was so amazing to read books where the main character was like me when I was that age. His borderline-obsession with musical theater and his difficulty accepting his feelings was so relatable and to see such a character be front and center in a book easily available to kids is something I'm just so grateful for. It was the first time I'd ever seen myself in book pages, and I just wanted to say thank you very much." As we celebrate Banned Books Week, I just want to pause for a moment to think about what this young man said. Not only was he able to relate to this story, but it was readily available for kids. That's the thing -- we need to provide these opportunities for our students to discover themselves in our shelves, with books that are available and easy to find. 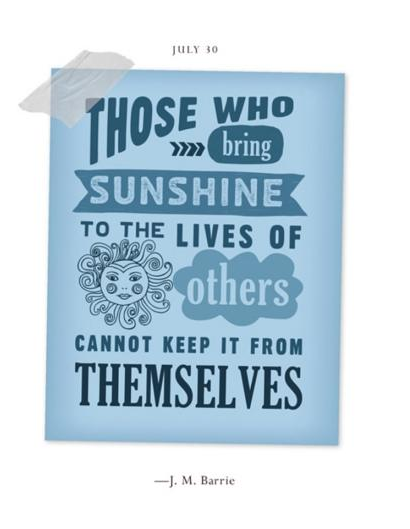 Take a moment to share with your kids why this is important to you. Make the idea of our freedom to read palpable and concrete for your kids. And next time you see your librarian, tell them that she or he is your favorite superhero: CHAMPION OF FREEDOM. As a school librarian, I love helping kids and teachers discover the opportunities that technology offers for learning, creating and engaging with the world. Whether it's through the power of creating a multimedia presentation about a book they've loved, or the fun of competing with friends while kids play math games online, technology offers our children opportunities to learn in new ways. Many schools are offering "one-to-one" programs where each child has their own personal computing device, whether it's a laptop, iPad or Chromebook. But in California, we operate on a very limited budget. So my question has been: how can I make an impact as a school librarian by looking for smaller funding opportunities? How can I increase access to technology in smaller, incremental ways? With this in mind, I am presenting at this year's ALSC Institute a session called "Tech Access on a Budget". 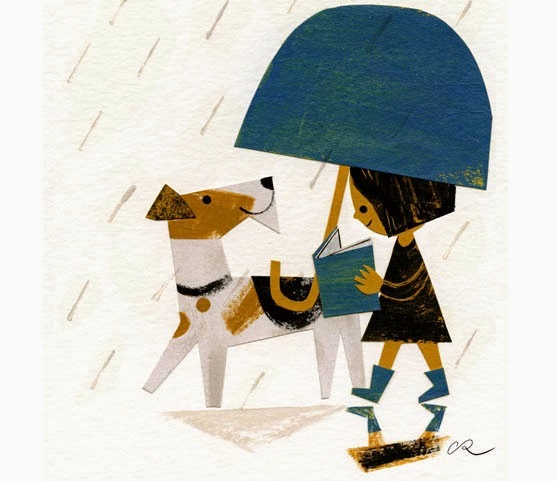 This conference is for children's librarians across the United States, through a division of the American Library Association called ALSC: Association for Library Services to Children. I wanted to share our presentation here. I am presenting with three other dynamic, smart, passionate women and have learned so much creating this presentation. Talk about the power of technology -- we had never met in person before we showed up 30 minutes before our presentation! 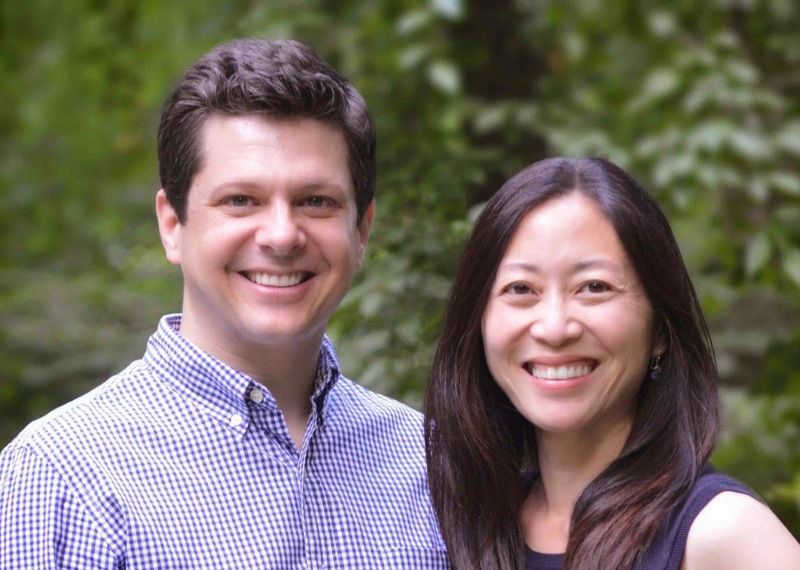 All of our connections had been through email, Google video chats and conference calls. Cen Campbell is the founder of LittleeLit.com, "a crowd-sourced, grass-roots professional learning network that works to develop promising practices for the incorporation of new media into library collections, services and programs for families with young children." This is a terrific resource for librarians. I first reached out to Cen because of her work with young children in a public library setting, and I wanted to combine our school and public library perspectives. Cen was a member of ALSC's Children and Technology Committee and I'm a member of AASL's Best Apps Committee. Suzanne Flint is a child development expert who works for the California State Library, helping administer the federal grants provided by the Library Services and Technology Act. She has provided an invaluable perspective both as a funder and as a child development expert. Suzanne and Cen have worked together developing the initiative: Early Learning with Families 2.0. Claudia Haines is a children's librarian at Homer Public Library in Homer, Alaska, in rural south-central Alaska. Integrating interactive digital media into offerings like storytime is part of Claudia’s efforts to inspire kids to use a variety of tools to create and explore at the library. Definitely check out Claudia's blog, Never Shushed. We had our first presentation yesterday and are presenting again today. We know that many librarians cannot travel to the ALSC Institute -- please share this with librarians you think would be interested. And I know we would all be happy to answer any questions you have about our experiences increasing children's access to technology in developmentally appropriate ways. One of my great joys is connecting students with authors who inspire them. The moment I first read Andrea Davis Pinkney's Hand in Hand: Ten Black Men Who Changed America, her voice filled me with hope and song. I knew I wanted to share that same voice with students in Berkeley. And so I'm thrilled that she will be visiting this week, speaking at an elementary school, a middle school, and with families at a fireside chat. I especially like sharing resources from TeachingBooks.net with my students -- listening to how authors pronounce their name, hearing their voice, and watching videos. My students really liked the variety of images I was able to share -- from pictures of Andrea with her family to illustrations from her books. 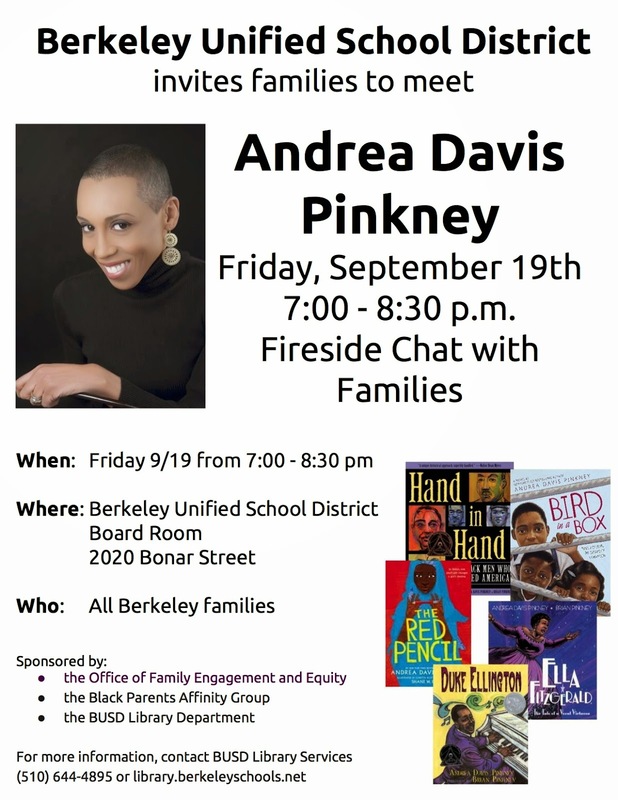 It's a busy week here in Berkeley, as we get ready to host several author visits -- Andrea Davis Pinkney, Rita Williams Garcia and Jacqueline Briggs Martin. They're all in town for the ALSC Institute. We feel incredibly lucky to be able to connect these inspiring authors with our students. Many kids love learning about different regions of the world. 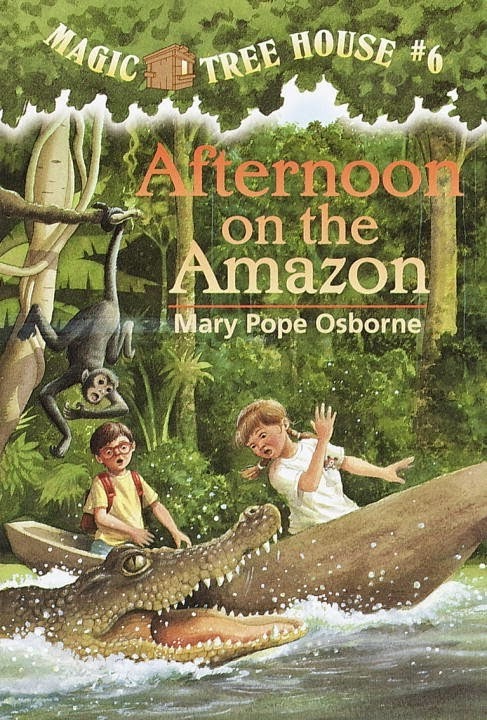 In fact, one of the real highlights of the perennially popular Magic Treehouse series is that Jack and Annie can visit so many places just by wishing. So I'm thrilled that there's a new volume in the terrific series Let's-Read-and-Find-Out Science. Have you ever wanted to visit the tropical rainforest? Well, be sure to bring along your bug repellent, waterproof backpack and notebook. 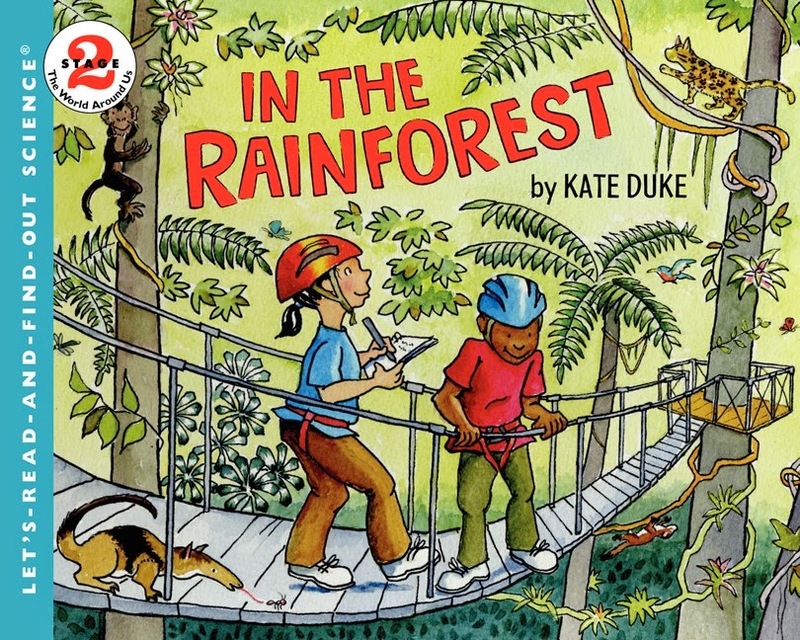 Duke draws kids right into her informative book by having a two kids join a guide as they explore a tropical rainforest. Speech bubbles keep the tone fun and casual, while the main text is more traditional informative nonfiction. "Ready for a tour of a tropical rainforest? Come on--the trip starts here." Readers learn about what a tropical rainforest is like, both in terms of its ecology as well as the animals and plants that live there. Throughout, Duke helps readers compare tropical rainforests to forests in temperate climates. For example, as you can see in the spread above, she illustrates that a tropical rainforest will typically get ten times as much rainfall as a temperate climate. This book works well both as a read-aloud and as a book for young students to browse through themselves. The pictures, captions and dialog boxes are all very informative and easier to read because of their conversational tone. For example, in the picture below the young girl says, "Hey, my sneakers are still dry. I thought a rainforest would be like a swamp." "The thick layer of leaves up above keeps a lot of the rain from getting down here, except during the rainiest months." "Duke’s friendly cartoons effectively communicate the immense variety of plant and animal life found in rain forests and feature cutaway views and close-ups in several spreads." My first and second graders at Emerson are going to love this book. Last year, we had a group of 2nd graders who formed a book club to learn all about rainforests together. They loved reading Afternoon on the Amazon (Magic Treehouse book #6) so much that they wanted to learn more about the Amazon rain forest. The teacher encouraged nonfiction book clubs so students could build their knowledge of different topics in a small group. It was a great success. 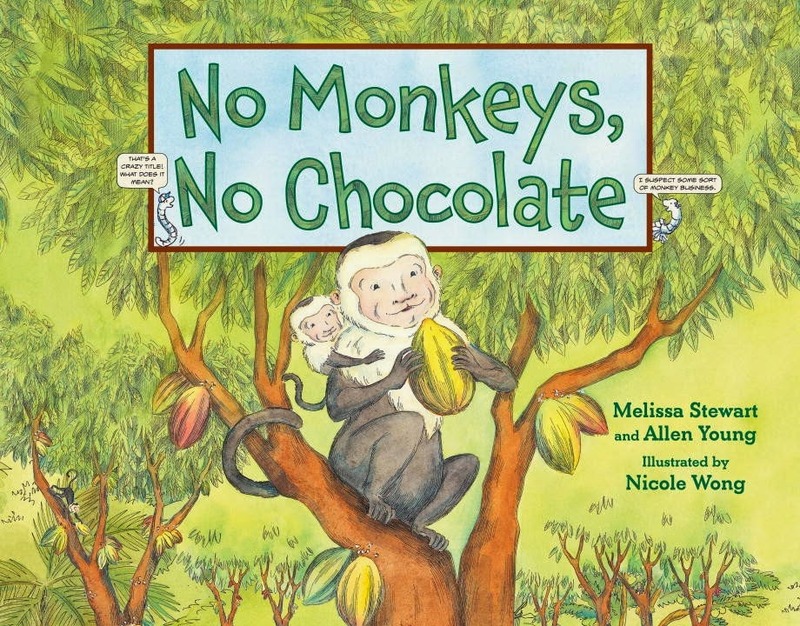 If you like this, I'd highly recommend another favorite nonfiction picture book: No Monkeys, No Chocolate, by Melissa Stewart and Allen Young. 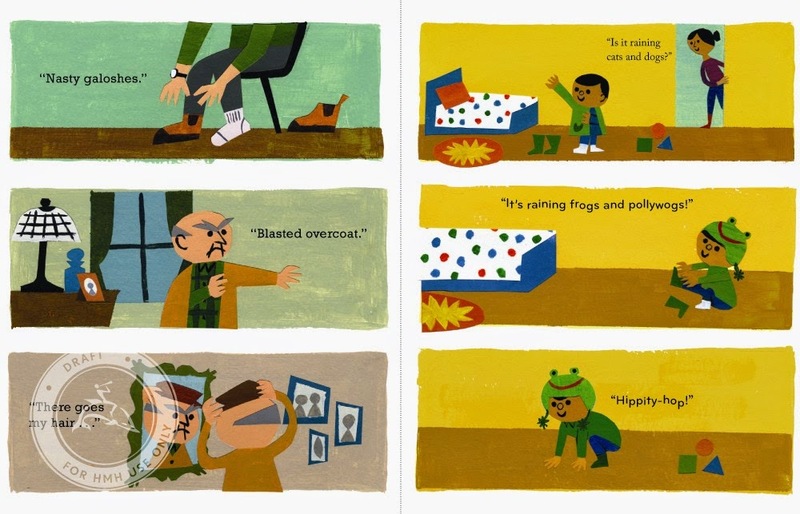 This book also uses colorful artwork with a cartoonish feel and a blend of conversational dialog and informational text. The authors take readers on a journey from cocoa pod, following the life cycle of the tree back to stems, roots and beans. Throughout, they weave in the concept of the interdependence of plants and animals. The review copy was kindly sent by the publisher, HarperCollins. If you make a purchase using the Amazon links on this site, a small portion goes to Great Kid Books. Thank you for your support. "Maybe it was exactly what I needed to hear at that particular moment in my life..."
Last week was exhausting, both at home and at school. So I welcomed a quiet, quiet weekend to recharge. 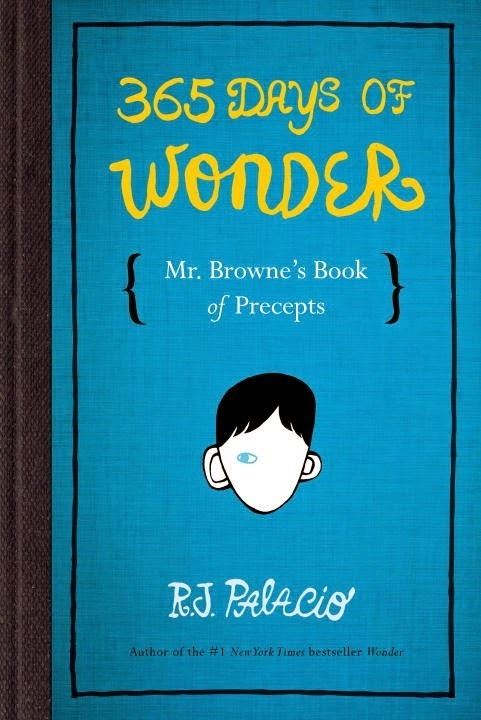 I found myself paging through a book I bought for a teacher friend of mine, R.J. Palacio's new book 365 Days of Wonder: Mr. Browne's Book of Precepts. It was indeed, just what I needed at that moment. I could turn the pages, finding nuggets that stayed with me, settled in my heart and sent ripples out into my tired soul. I know my students and my teachers will love turning to this again and again. 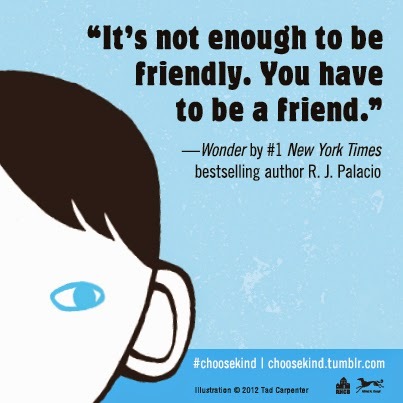 Wonder is a book that swept through my school, passed from child to child, in 2012. Palacio tells the story of a young boy starting middle school, after being homeschooled for six years. Auggie has severe facial deformities, and we read about his journey from several points of view -- connecting not only with his character, but thinking about how we would act if we were sitting next to him in class. In this new book, we hear directly from Auggie's teacher, Mr. Browne. Throughout Wonder, Mr. Browne shared precepts, or "words to live by," as he explains to his students. At the beginning of each month, he would share a new precept and students would write a reflection about the precept at the end of the month. In this collection, Mr. Browne shares 365 precepts -- gatherings of quotes by philosophers, song writers, politicians, fictional characters, and students across the nation. Ms. Palacio has heard from hundreds of students about #thewonderofwonder and the impact her novel has had on them. In a wonderful move, she asked her fans to send her their own precepts, written in their own handwriting. And so intermingling quotes from Aristotle and Goethe are sayings and drawings submitted by real kids. And so I want to begin the week carrying this special book in my heart. I want to remember the power of a smile to connect me to other people. 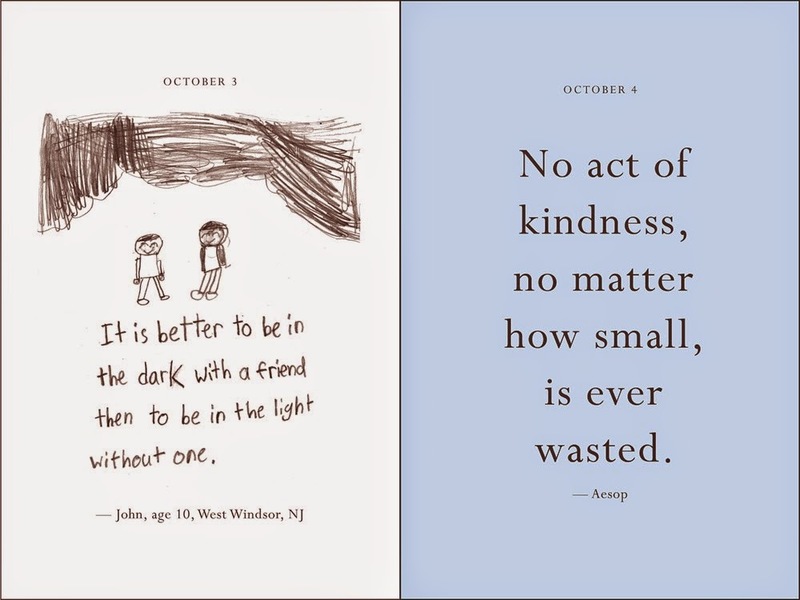 I want to choose kindness, even in the smallest moments. And I want to see my students each as individuals with a host of stories inside each one of them. But I also want to talk about these ideas with my students -- to be explicit. This book was just what I needed to recharge. Thank you, Ms. Palacio, for keeping Mr. Browne's ideas alive in your heart and sharing them with the world. I purchased the review copy at my local, wonderful bookstore: Mrs. Dalloway's. If you make a purchase using the Amazon links on this site, a small portion goes to Great Kid Books. Thank you for your support. "Who's grown over the summer?" I asked my 2nd grade class today -- and 20 hands shot high into the air. They ARE bigger, and yet... they're still little kids, right? So are they big, or are they little? And what's that all really mean, anyway? 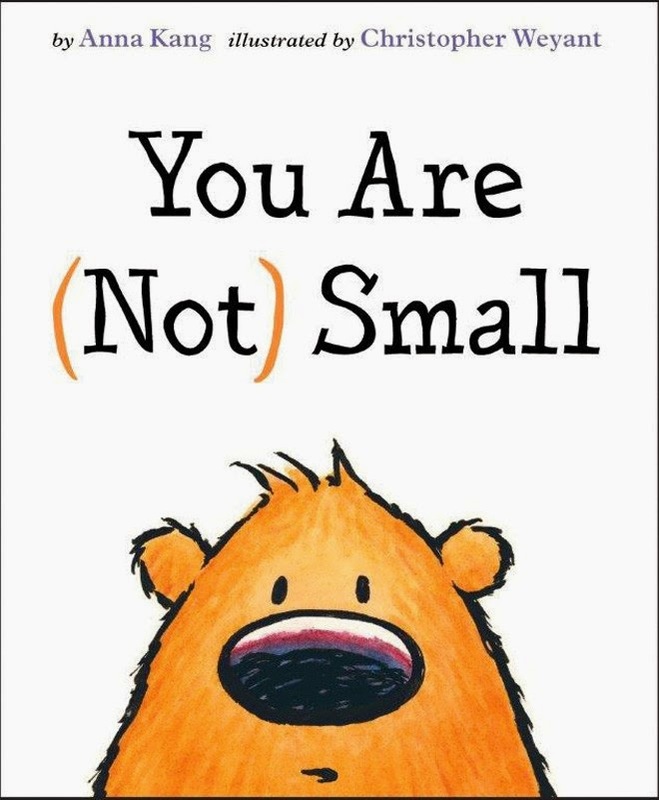 Anna Kang's new picture book, You Are (Not) Small, helped us talk about this -- and then extrapolate to what it meant about other things in our lives. 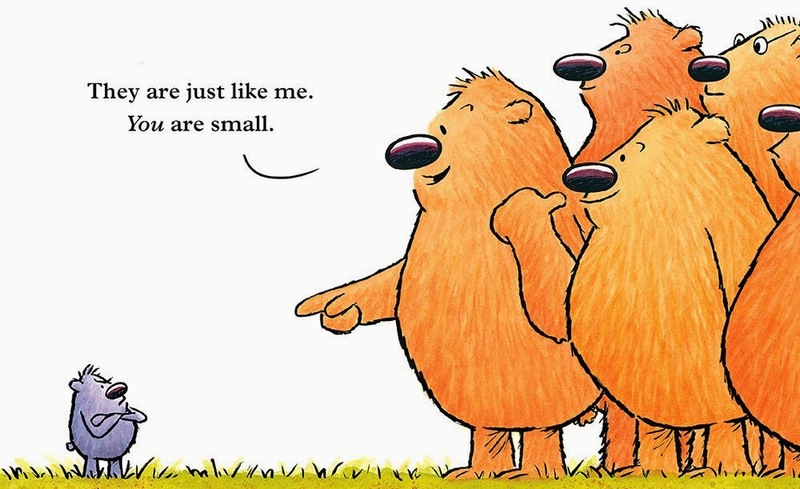 A small purple creature walks up to a larger orange fuzzy one and the orange creature promptly declares, "You are small." Well, I wonder how that makes the little guy feel? He turns around and says, "I am not small. You are big." It's not me -- it's you who's different. They each bring out a host of friends to show how they're like everyone else -- and it's the other guy who's different. My students could easily relate to the argument that quickly escalated into a shouting match. When a giant stomped into the middle of the scene, forcing everyone to reevaluate who exactly was big and small, I could just see my students' perspective shifting. I loved talking with 2nd graders about how they could relate to being big AND small at the same time. As 2nd graders, they are now the big kids out at recess with the kindergartners and 1st graders. They know how everything at school works. But if they walk upstairs, right away they feel small again peeking into the 5th graders' classroom. Even better was the way I could encourage them to apply this to other areas, seeing how they might feel good about themselves doing one thing, but not so good doing something else. Duncan said he felt "big" when he played baseball, but not so big when he had to be catcher. We even applied that to ourselves as readers, and what it meant to choose a book that was "just right" for ourselves -- not worrying about other kids in the class. My childhood, observing my daughters and what they experience, characters I want to see come to life, a particular feeling or problem. Where specifically did “You Are (Not) Small” come from? I eventually learned that how you saw yourself and others depended on your personal experience and your community, that perspective is subjective and not necessarily the entire truth. So, years later, when I sat down to write a story for a children’s book, this idea naturally popped out. I look forward to talking with kids specifically about Anna's experience -- I think many will relate. 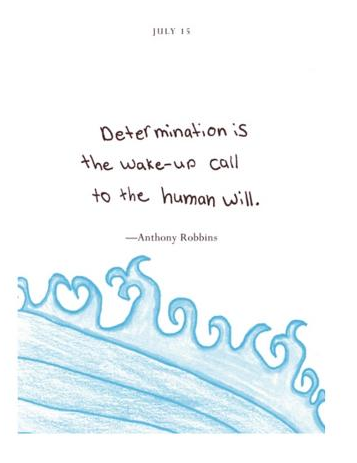 What a terrific way to begin the year -- recognizing that we all have strengths and weaknesses, that we are all growing and have changed over the summer, but we're all growing at our own pace. Many thanks to friend Alyson Beecher for recommending this at her site Kid Lit Frenzy -- check out her interview with Anna and Christopher. The review copy was kindly sent by the publisher, Two Lions. If you make a purchase using the Amazon links on this site, a small portion goes to Great Kid Books. Thank you for your support.